After we ask this question, we listen. And when we respond, our collaborative approach is based on more than a financial profile. Our experience and expertise combined with a wide range of financial services will help you simplify the complexities of wealth management and plan your financial future with confidence. We start by helping you identify your goals and evaluate where you are relative to those goals. 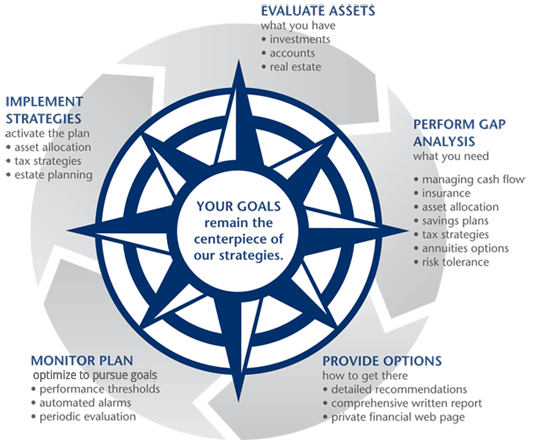 We take the time to explain and educate you about our investment philosophy and how your portfolio is managed. We evaluate your options and recommend strategies to get you where you want to be. We don't stop there. We help you implement the recommendations. Then, we monitor your financial situation providing information and continuing education.